YPG DISCOUNT: BIGNY’S 30TH Annual New York Book Show! 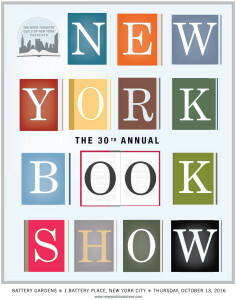 The New York Book Show offers publishing and printing professionals an opportunity to mingle while honoring the best examples of quality book design and production from the previous year. In honor of the 30th Annual New York Book Show, the Book Industry Guild of NY is offering $30 tickets exclusively to 30 YPG members! Come celebrate the most visually stunning books of 2015 with appetizers, a hot buffet and carving station, dessert, and an open bar. The first 30 YPG members to email Steve Bedney of BIGNY are eligible to purchase a $30 Book Show ticket: sbedney@gmail.com. Please give Steve your name, company and cell phone number. Steve will forward responses to Andy Ensor and Mike Kwan of BIGNY, who will send the YPG member a Paypal invoice. You will have 48 hours to complete payment. If there is no response during this time, BIGNY will offer the slot to the next person on the waiting list and repeat this process until all 30 tickets are distributed.